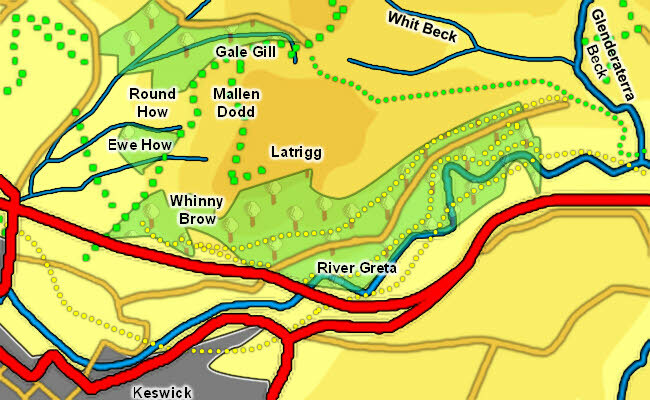 Latrigg is the southernmost foothill of Skiddaw, and its steep slopes provide an attractive feature in the Keswick scene. Latrigg somewhat resembles a much smaller version of Dodd - a steep sided outlier with woods around the sides and great views of Derwent Water. It is a familiar sight for drivers on the A66 approaching Keswick. Latrigg is a popular short walk, but it is also a busy point on the route up Skiddaw from Keswick. The path can be followed all the way from Keswick, or from a small car park at the northern side of the fell. The top of the fell is a fantastic viewpoint, with a great view over Keswick to Derwent Water. The fell is a little more complex that it first appears - the simple western end is balanced by a long eastern ridge that runs out for nearly a mile from the summit, and that makes a super walk. The easiest way to reach the top of Latrigg is from the small car park just to the north of the summit. This is easiest to reach from the roundabout where the A 591 meets the A66. Head north onto the A591, then almost immediately turn right. Follow this lane to a hotel, then turn sharply right and follow the road up the valley of Gale Gill to the parking area (beware of ditches close to the road). From there make your own way across the gently grassy slopes to the summit. The fell can also be climbed direct from Keswick following the Cumbria Way, which leaves the town at Briar Rigg and then climbs around the western flank of the fell. Just before the car park look for a path that cuts back to the right and makes its way south then east to the summit. There is also a super track that runs up the long eastern ridge, starting near Brundholme. Follow this track till it crosses a beck at the corner of a forest then take the path that branches off to the left to reach the top. The southern and western flanks are rather steep, and best tackled via the paths. We don't have a walk that visits the top of Latrigg, but we do have an ascent of Skiddaw from the Latrigg car park. The top of Latrigg is a pleasant grassy pasture, with a steep southern flank and stunning views down Derwent Water. The area is sometimes used by a gliding club. The River Greta forms the southern boundary of the fell, flowing from east to west into Keswick. A nameless beck flows east from near the car park, forming the first part of the northern border. It then joins Whit Beck, and the combined streams continue east. They join Glenderaterra Beck, which forms the short eastern boundary before flowing into the Greta. Gale Gill rises just to the west of the car park and runs down a wooded valley. On the valley floor it joins the complex web of streams and drains in the fields and reaches the Derwent north of Keswick. The small becks that rise on the western slopes of Latrigg all run into Gale Gill.